“The Celts are coming! The Celts are coming!” Actually they are here already, dating from the pre-Christian era. In this renaissance, they have brought their own portfolio of national epics, ancient gods, and traditional music. There are five collections of traditional Irish Epics, called “Cycles”; they are the “Mythological,” the “Ulster,” the “Cuchulainn,” the “Finn,” and the “Cycle of the Kings.” An epic is a long narrative poem that tells of the heroic deeds of divine and quasi-divine beings and heroes. Epics were transmitted from one generation to the next through poems, songs, and narrations of bards. Markale is an acknowledged expert in the field who lives in Celtic Brittany in the medieval town of Poul Fetan. Gladding provides the English translation of the French original from around 1970. The analysis of each epic is a guide to the reading of the full texts. 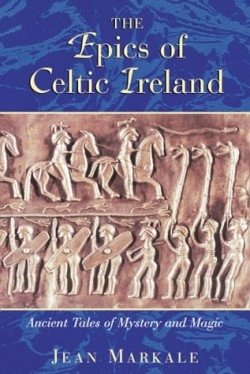 It is a combined “Who’s Who” of Celtic mythology, a “time line of the various reincarnations of the heroes,” and a “road map of the Celtic regions of Ireland.” The addition of an index of subjects, names, and a glossary of obscure Irish terms would enhance things. The greatest of the Irish heroes is Cuchulainn who is memorialized not only in the epics, but also in public statues, the media, and the Internet. His birth and education were supernatural. In one episode, “the narrative ends with a description of [young] Cuchulainn putting on fresh clothes. To begin, he transforms his body into a crimson wheel that is, he celebrates his triumph complete, he literally ‘does a cartwheel.’ He had seven toes on each of his two feet, and seven fingers on each hand…” Later, Cuchulainn begins one of his fearsome contortions: “He twisted his body in the middle of his skin; his feet went behind him; his heels, calves, and buttocks went around to the front” It is exciting to vicariously participate in such extraordinary adventures as retold in these epics.